ast August, my friend Phil Browning (otherwise Flip) and I found that we had three weeks excess time on our hands before we had to get back to the college grind. Our resources were one Arrow Sport biplane (companion cockpit, sixty-horse LeBlond), two toothbrushes and four itchy feet. We had accomplished the old stunt of rattling around the country in a Model T in search of adventure, and after a few hours cogitation, decided that we had a new idea on an old plot. We carefully wrapped our baggage, threw the fire extinguisher out to save half a horsepower, patched a hole in the upper wing, and started off to skim over four or five states with the wind as our only compass. 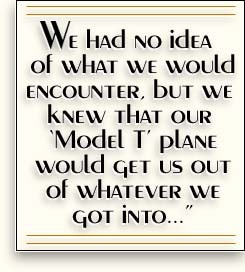 We had no idea of what we would encounter, but we knew that our Model T plane would get us out of whatever we got into and there we rested content. Our primary thought had been to get away from people, but we reckoned without the kindly curiosity of the Middle West. Our very first landing in the southern part of Michigan assured us that we belonged to the curio section. We had spotted a nice green meadow and as the LeBlond had begun to drum too incessantly upon our ears we landed to obtain some relaxation and a quantity of quiet. We rated neither. Almost before our gear touched the grass we were surrounded by an anxious crowd which wanted to know whether or not we were still alive. There ensued an hour of continuous caution concerning the prop and an hours effort to keep alien feet off the catwalk. Aviation had become commonplace to our locale, so we found it hard to understand all this curiosity, this abundance of questions. 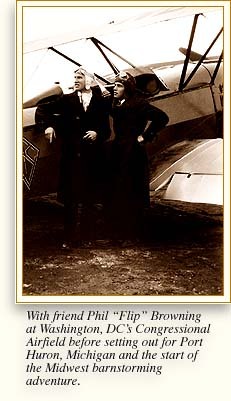 Flip tired himself out explaining all the functions of the parts and finally in self-defense we cranked up and continued our journey, resigned to the truth that after all aviation was still a sideshow to some people. For the next two weeks all the rest we received was found upstairs in the little companion office. Our time on terra firma was mostly spent in guarding our precious Sparrow from thoughtless damage, explaining why airplanes really flew and refusing invitations to make ourselves right at home. Hospitality was proffered in all its forms, and if anyone thinks that this modern machine age has deadened our American kindliness and good fellowship, just let them take a backyard tour of the Middle West. We spent only one night in a hotel, and that because we landed in a thunderstorm after dark. The food offered would have done credit to the Waldorf. At the beginning of the trip we were a little skeptical of our ships abilities, but when, time after time, she pulled us out of small, muddy fields, we rested assured that the orange wings and wide-spanned wheels were capable of anything. Her faculty for ground-looping at sixty miles an hour saved us from caressing many a fence. Though she climbed slowly when once in the air, she lost very little time whenever we zoomed her out of cornfields to miss trees. At Newport, Indiana, we landed to take on gas, but the second our wheels touched the grass, we sunk a foot and stopped without rolling twenty feet. We fully expected to nose over, but the Sparrow set her teeth and put her tail right down. We took on the gasonly five gallons, to save weightand then used up half the fuel attempting to get off. Although the field was a mile long, we spanked grass the entire length without rising an inch. The prop almost completed the harvest by chopping at the tall growth and making the sound of a machine gun quartet.